Happy Labor-Free Day everyone. Now, let's see what's out there. Gotta give Kim Clijsters big props for going this far in the U.S. Open. She was out of the game for 2 years having here child, then comes back and defeats the number 3 in the World. Not too shabby. 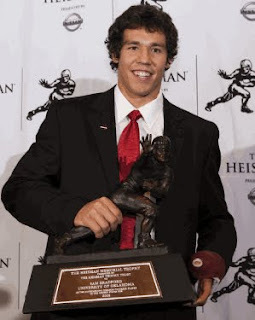 Hate to say it, but what happened Saturday Night to Sam Bradford is exactly what you feared when he decided to come back to Oklahoma this season. Bradford, who would have been a Top ten pick in the draft, if no the number 1, decided to come back and play another season in Oklahoma. And now, with the shoulder injury that occurred on Saturday, you have to wonder if he just jeopardized his chances to play at a high level in the NFL. Quietly, Ichiro is having not only a superb career, but a Hall of Fame career. The 2nd fastest to 2000 hits, he is 5 hits away from 200 for the season. If Ichiro gets to 200 again this season, he would set the record for most consecutive seasons for 200 hits. A 8 time Gold Glove winner, Ichiro has a career batting average of .333 and averages around 35 or so steals a year. What's most amazing though, about Ichiro to me though is his durability. For a guy who's listed at 5'9" (yeah, right) 160 lbs, the man has never played less than 157 games a season. Amazing. Completely hate the fact that the Jets waived Danny Woodhead. The kid, out of tiny Chadron State is in 2nd place all-time in the NCAA for all-purpose yards, behind Brian Westbrook. Barry Sanders is the only college player to accumulate more all-purpose yards than the 3,159 that Woodhead gained in 2006. He had 158 yards in 18 carries against the Eagles last week. I don't like the move. Not saying that Woodhead could have been the next Barry Sanders, but I think he had the kind of spark that could get a team going in certain situations. What in the name of Jebus is Michael Crabtree doing? Holding out before you've played a down of professional football is always a dubious decision, but threatening to hold out for an entire season, your rookie season, because you think you should be paid more than guys who were taken ahead of you, is not just arrogant, but criminally stupid. How can Crabtree, who, again, has never played a second of professional football, deem 20 million dollars "unacceptable." And up until the second of next season's draft, Crabtree will be the property of the San Francisco 49ers. he can't go to the combine, can't talk to any other teams, he can sit on the couch and wait until the 2010 draft begins. Will his value really increase over the next season considering he has done nothing between last season's bowl game and the 2010 draft? Amazing move by the Patriots on Sunday in trading Richard Seymour to the Raiders for a first-round pick. But let's think about it. Will the Patriots miss him this season? Most definitely. However, Seymour hasn't made the Pro Bowl since 2006, has been dinged up recently, turns 30 this season and will be a free agent next season—and you just know he will demand top dollar. So, instead of paying top dollar for past achievements, while on the wrong side of 30, the Patriots decided to send him to a team they feel will have a high draft pick next season. The Patriots have no problem getting rid of guys who are getting older and who demand more money—think back to the cutting of Lawyer Milloy in 2002. Planning ahead, heartlessly, is what has kept the Patriots consistently on top over the past decade. To Russ Mitchell and his completely overblown column calling the Alabama-Virginia Tech game a disgrace, dude, lighten up. The game wasn't a disgrace, it was exactly what you expect: Virginia Tech to win through defense and special teams. And the reason why the Hokie running game "had no experience whatsoever" was because their returning starter got injured. So, really, Mitchell, lighten up. Completely amazing that the second John Smoltz and Brad Penny get dumped by the Red Sox and move to the National league, they turn into Cy Young and Walter Johnson. Goes to show what pitching in the AL East is like. Guy to watch: Austin Collie, WR for the Colts. A rookie, drafted in the 4th round, Collie has shown the ability in camp to play well with Peyton Manning in the slot. With good burst off the line, and good hands, Collie can turn into a nice safety net for the Colts and put up a lot of first downs for Manning. 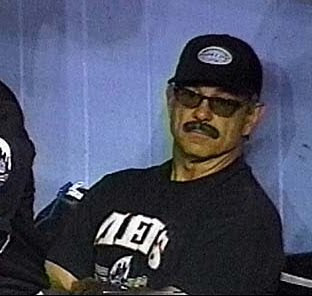 And finally, the buzz is that the Nationals would like Bobby Valentine, who had been coaching in the Japanese League. Not a bad choice. Valentine did take two slumping teams, the Rangers and Mets, and make them appreciably better. Now, if he can bring his wacky glasses, he might distract the Nationals fans—all 5 of them—from how bad they are going to be for a while.